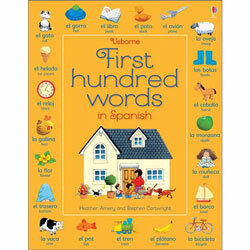 First Fun with Spanish is a beginner's guide to Spanish for young children, based on the best-selling book "First Hundred Words in Spanish", published by Usborne. Each scene in the DVD corresponds to a double-page spread in the book. Follow Isabel and her family as they go about their day. Isabel's family do not speak English so she will translate everything for you. We join Isabel and her brother Pablo as they wake up. After a chaotic breakfast, it's off to Grandma and Grandpa's. The a trip to the shops and a visit to the park introduces lots of familiar objects. After a busy and fun-filled day, it's home to play, bathtime and bed. To add to the fun, there is a little 'yellow duck' ™ to find in every scene. "First Fun with Spanish DVD" is intended for young children who are complete beginners to the Spanish Language. This DVD is produced in Europe and is a Region 2 DVD. This means that it is coded for use on European and Japanese DVD players only, although it may work if your equipment has been adapted to become "multiregion". In addition, this disc uses the PAL format for colour encoding. US / Canadian systems use the NTSC format as standard and not all are capable of playing PAL media. If you are based overseas, please check your equipment before purchase. i THOUGHT THAT THIS MIGHT BE TOO OLD FOR MY GRANDSON (2 1/2 YRS) BUT HE LOVES IT. IT RELATES TO WHAT A TODDLER MIIGHT DO IN A DAY WITH ENGLISH EQUIVALENT GIVEN. Excellent, really enjoyable, I hoped this would help learn just a few of the basic words in Spanish but was so much more, very good fun to watch with my kids they loved it too!